Sadly, I saw no yarn stores in China and so had no opportunity to acquire any souvenir yarn. However, I'm sure yarn stores must exist because, once I began looking, I saw women knitting - in public - most places we visited. Often these women were tending small shops and waiting for customers, but sometimes they had simply chosen to knit in some outdoor location. I feel somewhat uncomfortable asking people if I might photograph them, so I missed many opportunities for recording what people were knitting, but I did eventually pluck up my courage and, of course, like all knitters, they were only too pleased to show me what they were doing. 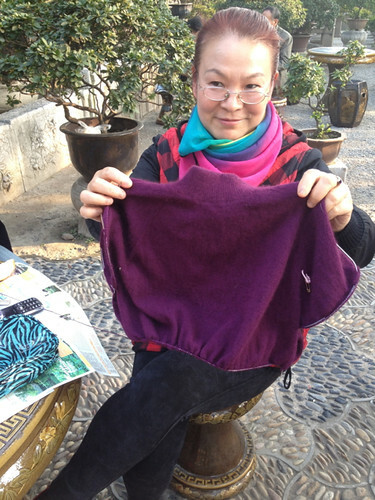 All the knitting I observed was done in the round, usually on four long metal double-pointed needles (dpns). Some knitters seemed to use a single, long flexible metal needle. I tried to find out what people were knitting (lots of gesture and mime needed) and mostly it was sweaters or, surprisingly, pants and, in one case, stockings. All were knitting with very fine wool and seemed very competent. 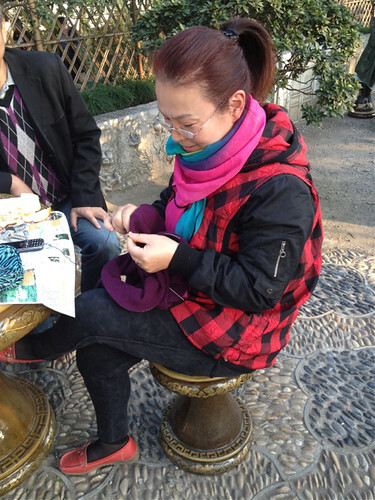 I loved this stylish woman knitting in a park in Shanghai while her companion read his newspaper. 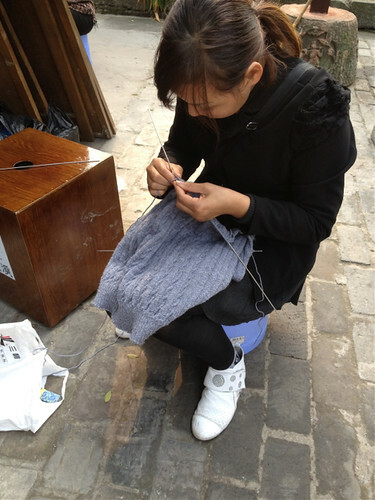 The yarn seemed to be an extremely fine angora mix and she was knitting her sweater in one piece from the top down. Very impressive. So much for other people's knitting. What of mine? There's not much to tell, unfortunately. As socks are such convenient travel knitting I began the Chouwa socks from Judy Sumner's Knitted Socks East and West just before I left. (You might assume from the title of the book that my pattern choice was most appropriate, but given that the 'East' in the title refers to Japan, and that Japan is not regarded with great affection in China, the choice was probably inappropriate). The socks took more than my four week trip to the Philippines and China to complete. Most of the knitting was done on planes and waiting in airports as I was usually too exhausted to knit in the evenings after a day's vigorous touristing, and the sights were too engaging for me to knit on buses or in other places. 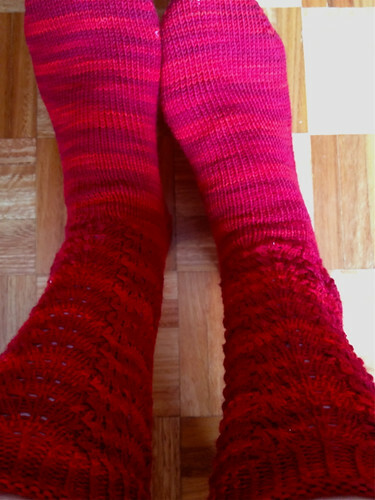 The yarn is Wollmeise Twin in the colour Rosenrot - the most vibrant red you could ever imagine. It's impossible for me to capture the intensity of the colour. 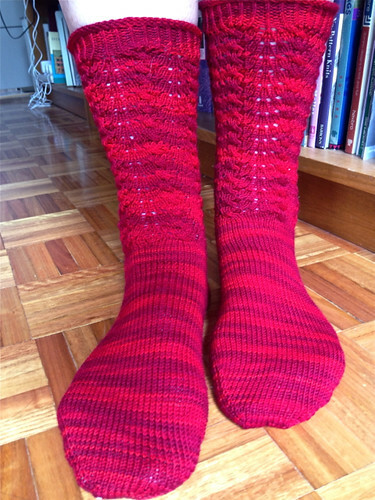 I like the socks themselves with patterning that busily mixes lace and cable stitches on the leg of the sock, and then has plain fabric for the feet. Very sensible and wearable. But there are other things to celebrate with these photos. The first is that the post-hip-replacement swelling has gone from my left leg so that I can fit the sock on...and the second is that I actually put the socks on and took them off all by myself. Such an achievement. Who cares if the resulting photos are not very expert? Counting my blessings - again. Christmas Eve seems like a suitable time to count my blessings. It's exactly four weeks since I slipped on a loose mat on my polished living room floor and broke my hip. Clearly, I'm not seeing this stupid accident as a blessing, but given that it happened, I have much for which to be grateful in its aftermath. I'm grateful for the paramedics who came so promptly to my emergency call in the middle of the night and dealt with me with competence, compassion and good humour. I'm grateful for the major teaching hospital that's my local hospital where they managed my pain until they could fit me into their busy surgery schedule. The wait was longer than I might have wished, but the surgery was done with competence and care. I'm grateful for a medical service that enabled me to have expert surgery and a closely monitored stint in intensive care (because of some blood clotting) at no cost other than my taxes in previous years. I'm grateful that I could afford additional private health insurance that has enabled me to have two weeks in a most civilised rehabilitation hospital with physio and hydrotherapy, as well as excellent medical supervision, to hasten my recovery. I'm grateful that four weeks after the slip I have a brand new hip (because of some minor pre-existing osteo-arthritis a decision was made to replace rather than repair the hip) that is working extremely well. I have no pain and I'm already walking around the house independently and making small excursions outside with the help of a walking stick. I'm grateful to my daughter who's taken time off work and interrupted her life to come and care for me on my return home. And I'm particularly grateful to the many friends, from many parts of my life, who've made the time to visit, phone, send messages, and ply me with gifts of flowers, fruit, delicious snacks and even yarn. Not only the gifts, but the conversations that kept me in touch with all that was happening in the outside world have been greatly appreciated. This evening I'm off to spend Noche Buena with old friends. I feel as if I'm slipping back into my life. One of the reasons I wanted to travel to China is because I think our future for the next several decades will be bound up, for better or worse, with what happens in China. This is particularly true for Australia, where our economy is so dependent upon China's development, but the choices China makes about its future will also have an impact on the world more generally. 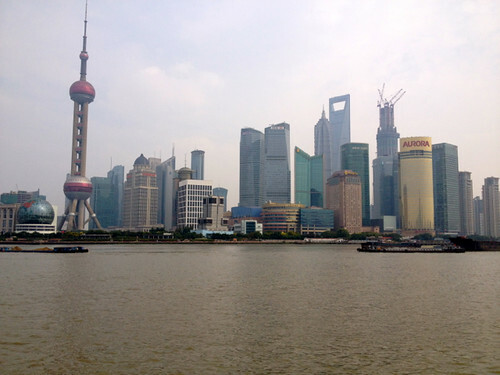 Pudong's futuristic skyline has become the symbol of modernity for popular culture. All of this development has happened in the last twenty years. Some of the architecture is inspirational; some more mundane. What impresses me is the pace of the development and the aspiration that makes it possible. 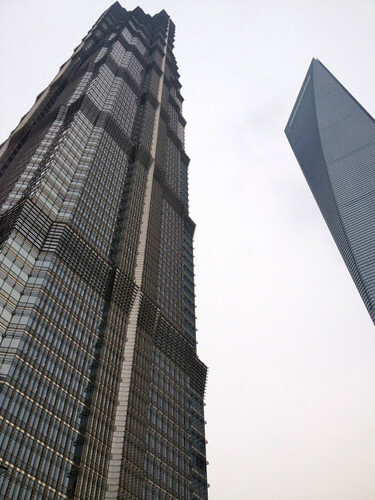 We went to the viewing area at the top of the elegant 88 storey Jin Mao tower (whose lift travels at a very smooth 9.1 metres per second - the Chinese love quantitative measures of their achievements). You feel as if the whole skyscape will have changed if you were to return in five years. 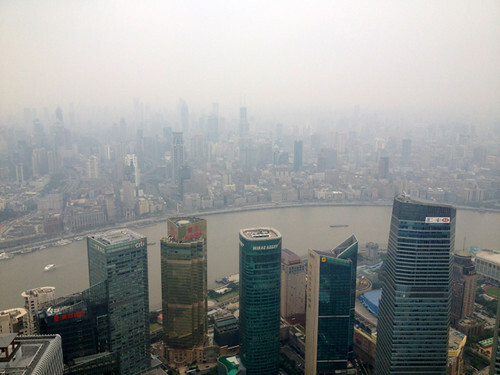 The view of new Shanghai is impressive, but the inevitable pollution generated by such rapid development in one of the world's largest cities is also very evident. This is an immediate problem for modern China. Managing people's movements around such a large city is clearly challenging. When I first visited China in 1983 the roads were crowded with bicycles. By my next visit in 2001 every road seemed to be in a state of 'improvement' to accommodate the rapidly increasing number of cars, and the second of the subway lines in the still-new metro development had just opened. Eleven years later there's a complex and very efficient network of twelve subway lines (with more under construction) enabling people to travel easily by train under Shanghai. But the road problem remains. 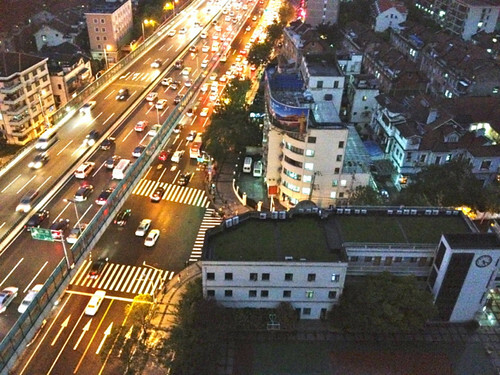 Outside my hotel window in Shanghai was an elevated six-lane highway with another six-lane road beneath. At all hours of the day and night it was thronged with traffic. 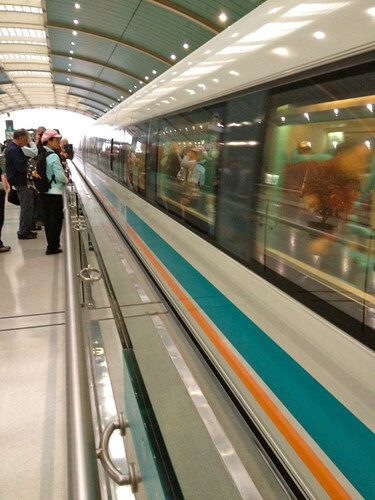 Probably the most futuristic experience of our visit was a trip on the Maglev train that runs between Pudong Airport and a suburban metro station. The distance travelled is only 31 kilometres and it seems as if this development was a kind of vanity project for the 2011 Expo in Shanghai. But it does show what's possible. Given the rate of development in China, who knows where it will lead? The train operates by some mysterious (to me) use of magnetism which minimises friction. Given the limited distance of the trip it reaches its maximum speed of 423km per hour for only a few seconds. Even so, the 31km trip takes only 7 minutes. In Australia, where our once-extensive railway system diminishes and deteriorates day by day one can only envy the possibilities of such developments. Shanghai is such an exciting city. A glimpse of the future. And finally... I said in a previous post that I would have difficulty choosing five favourite things in China, but I do have one very favourite thing. 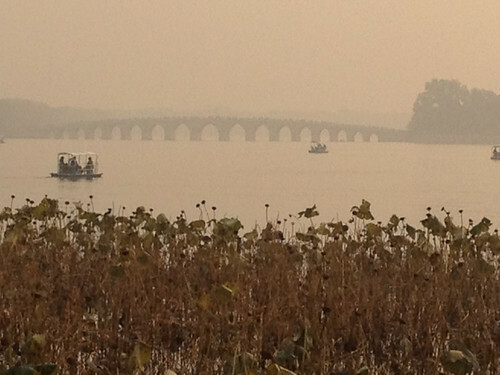 It's the river Li in the south of China. It's neither of the past nor the future. It's timeless. 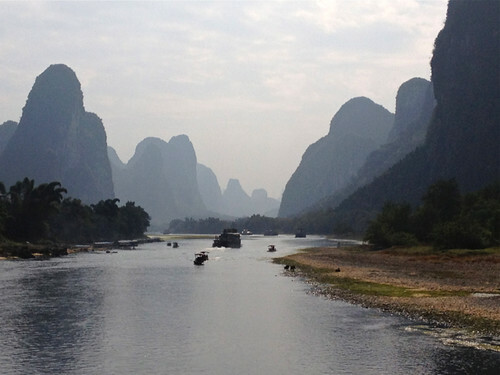 We visited Guilin on the Li, and then took a boat for about five hours along the Li River to the town of Yangshuo. Every minute of the boat trip was magical. 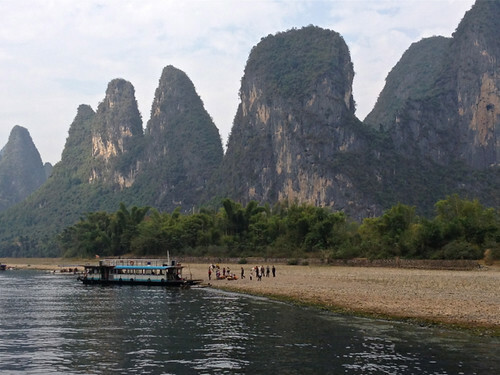 The Li River is quite shallow and winds its way between karst (limestone) outcrops. Every view - particularly on a misty morning such as the one we experienced - is like a traditional Chinese watercolour or scroll painting. There are very occasional small villages, standings of bamboo along the banks of the river, and fishermen on simple bamboo rafts using cormorants to catch fish. I could show many photos, but all are variations on the same theme - the lazy river, sheer rocky outcrops, simple ferry boats, and graceful vegetation. 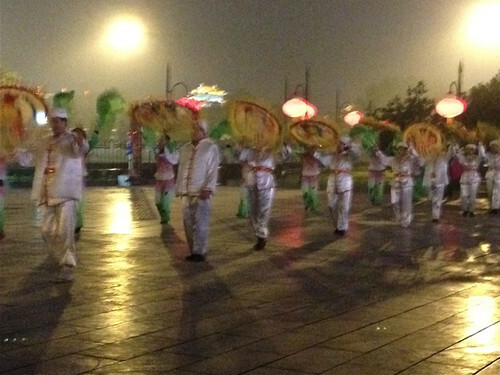 I wouldn't have thought anything could rival the delight of our trip on the Li River but in the evening in Yangshuo we went to a performance of 'Impresssions' - an astonishing presentation of the traditions and cultural diversity of this southern region of China. The stage was the Li River itself and the backdrop was twelve of the karst mountains, most beautifully and subtly floodlit. There were more than 600 performers, all drawn from the local area. The beauty, scale, grandeur and sheer bravura of the production were partly explained when I discovered that the creator of this amazing performance was Zhang Yimou, well known epic film director (Red Sorghum, Hero)who later went on to devise and direct the opening ceremony of the Beijing Olympic Games. 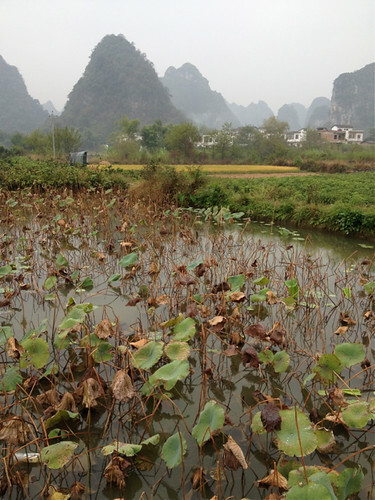 So, Guilin, the Li River, and the performance at Yangshuo - my very favourite experience of my China trip. 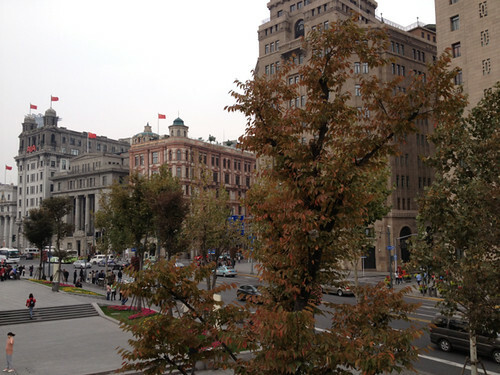 It's already a month since I returned from China - though so much has happened in the interim that it seems longer. 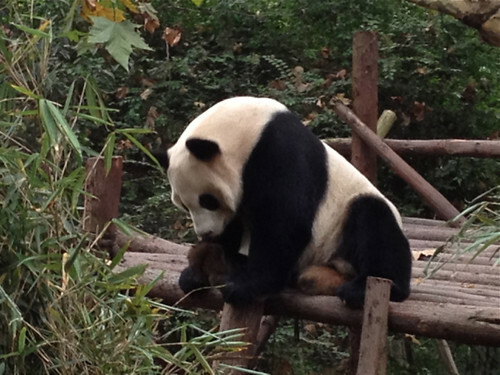 Even so, I feel the need to write some 'summing-up' posts about my China trip. There are things I still feel a need to say about my tourist's experience of China that haven't so far been reflected in my comments. Usually when I've travelled and blogged I've finished my posts about my trip with a 'five best things' post. I tried to do this for my China trip, but failed dismally. It's just too hard to distinguish and make judgments among so many diverse experiences. So, I've chosen to organise these last posts differently - around notions of time. So, to begin - the past. 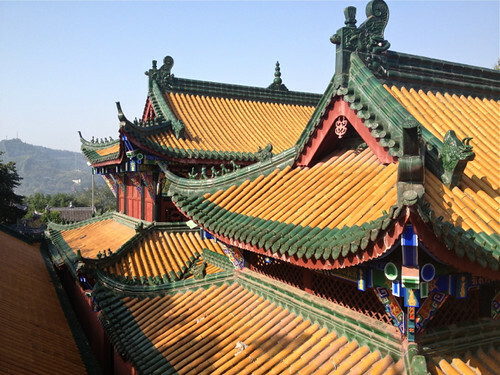 Almost everywhere you travel in China you are aware of the depth and richness of its history. Millenniums of history. More than a thousand years ago what we now call 'China' was not a nation state, but there were already centres of power and alliances and oppositions that lasted hundreds and sometimes thousands of years. Such a sense of tradition and development and sophistication must shape the identity of Chinese people in a very distinctive way. It sometimes seemed to me that the past is less visible to visitors through museums than it is in some other countries - particularly in Europe. This is understandable. As well as the discontinuity of traditions of the Chinese dynasties, in the nineteenth century many artifacts were raided by colonial powers; in the mid-twentieth century many treasures disappeared from mainland China when the Nationalists removed to Taiwan; and then finally Mao's Cultural Revolution of the nineteen sixties and seventies destroyed much of the past grandeur in its swingeing attempt to build a new nation. 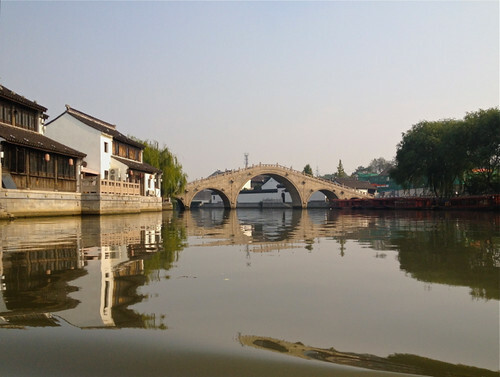 But fortunately, so much of China's past can be glimpsed through major constructions that were so grand they survived centuries of depredation - the Great Wall, the Summer Palace, the Forbidden City, Suzhou's Grand Canal. 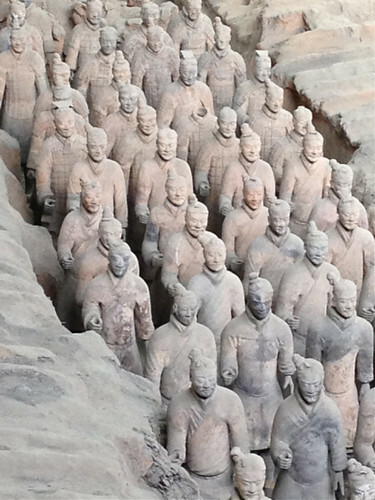 And, perhaps most grandly, the Entombed Warriors outside Xi'an. The Warriors were additionally fortunate in that they were not discovered until 1974 and consequently missed the worst destruction of the Cultural Revolution. 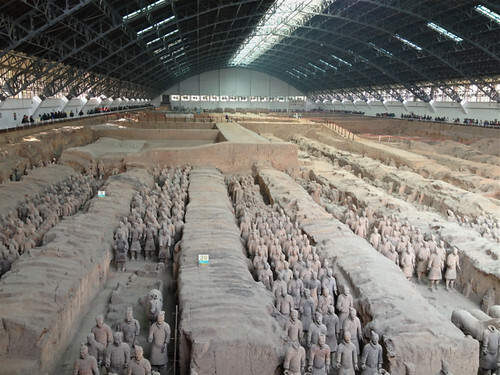 It's an extraordinary experience to enter the museum that houses the terracotta warriors and to glimpse the grandeur of the rule of Qin Shi Huang, the first Emperor of China. 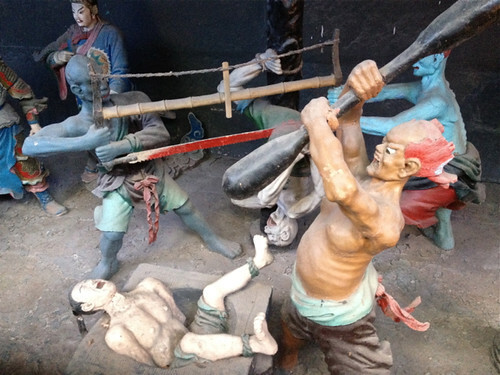 The warriors were buried near the tomb of the Emperor and their purpose was to protect the emperor in his afterlife. 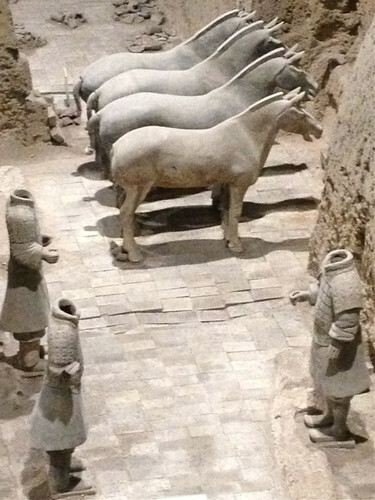 The life-size warriors and their horses date from 210–209 BC. I find this almost impossible to believe as the craft that's produced these figures is so perfect and somehow so modern. Maybe 'timeless' is a better word. Even though they're not on every corner, we did visit some wonderful museums. 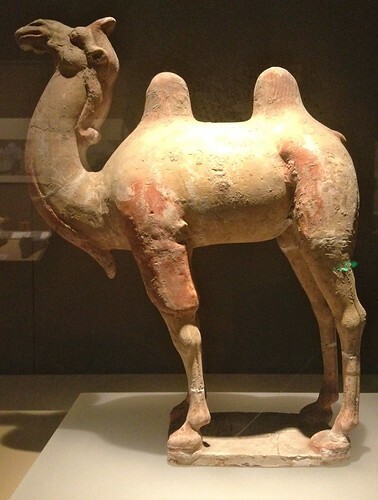 In Xi'an there's the Shaanxi History Museum with splendid exhibits from prehistoric to current times. 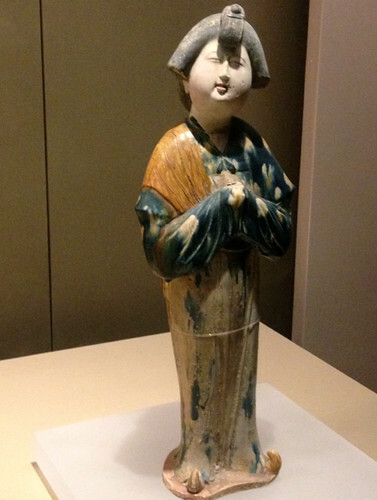 My favourites here are the tricoloured pottery figures from the Tang Dynasty (618-907). There's an immediacy and charming everyday quality to these pottery figures that I find irresistible - literally, as I bought a small copy of one of the ladies in the museum shop. 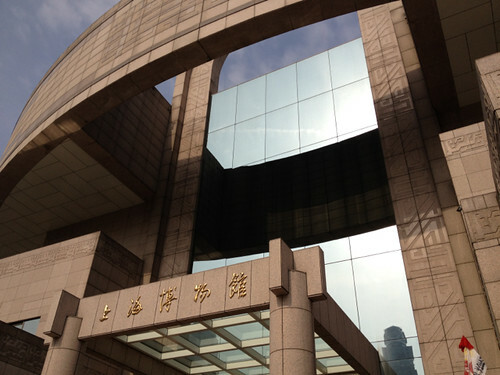 And then there's the grandest of the grand museums - the Shanghai Museum. Apart from the brilliance of its collection I was impressed by the busyness of this museum. It was thronged with local people, poring over the exhibits. I can only begin to imagine how moving it must be to see the such grandeur of the cultural traditions of your country's past. 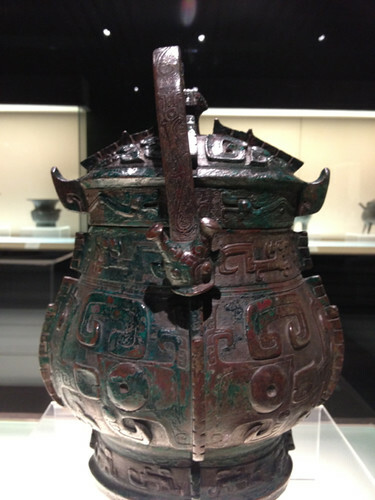 The Shanghai Museum is best known for its collection of bronzes - most of them more than 3,000 years old! Many of the pieces are beautifully decorated sacrificial vessels reflecting a sophistication of social organisation and artistic forms that I find mind-boggling. Again, I loved the Tang Dynasty tricoloured pottery figures, and I was astonished by the timelessness of the painted scrolls - many of them (somewhat ironically) on loan from US museums. But I spent most time in the ceramics section. I'm not sure how you can improve on perfect forms and perfect techniques. 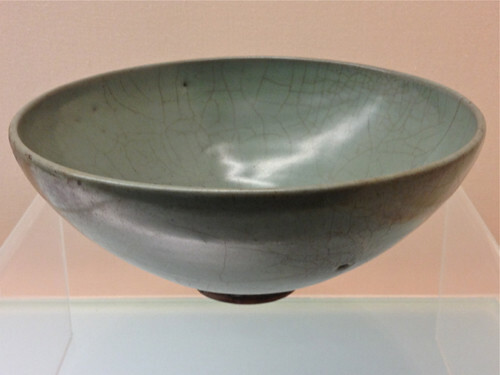 The bowl below is from the Song Dynasty, roughly 1,000 years ago, but its simple, elegant form transcends any sense of what's old or what's modern. The Shanghai Museum also has a gallery displaying artifacts from its 'ethnic minorities' (their term) - the 10% of the population who are not ethnically Han Chinese. This collection includes fabrics and textiles from various non-Han groups, and, as these ethnic groups cross borders, particularly in southern China, they have similarities to textiles and craft practices in Burma, Thailand and Vietnam. 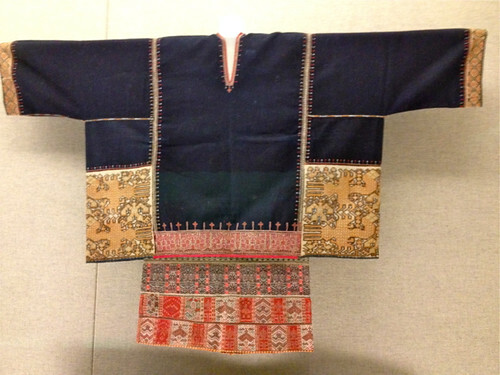 The superb woven tunic below is from the Li People of southern China. Those of you who know me will know I spent lots of time in this part of the museum. Tomorrow, a glimpse of the future. 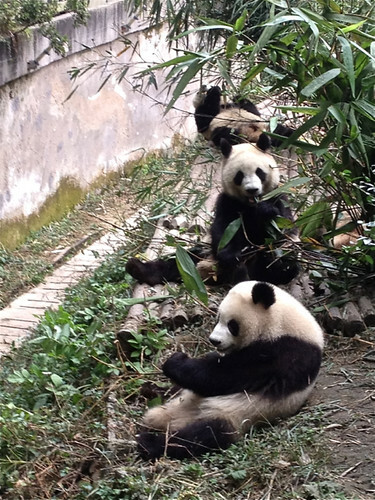 As we traveled throughout China we heard 'watch your step!' many times each day. Uneven footpaths; busy road crossings; paths through caves or gardens; the Great Wall, embarking and disembarking from boats; all were accompanied by the advice to 'watch your step'. Everybody did watch their step, and we completed the trip accident-free. However, I didn't succeed in remembering this advice once I'd returned to Australia. After a couple of days back in Sydney I slipped and fell and broke my hip. I'm now well on the way to recovery with a bright shiny new artificial hip. But I do wish I'd watched my step. 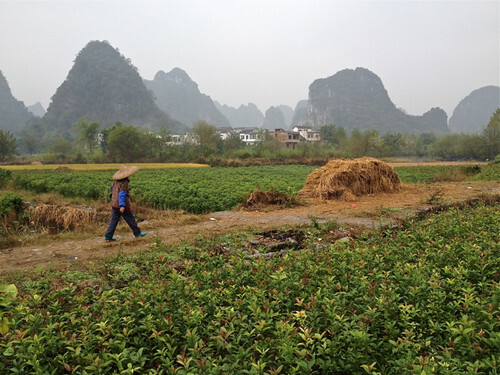 I’ve become interested in the role of gardens in China. 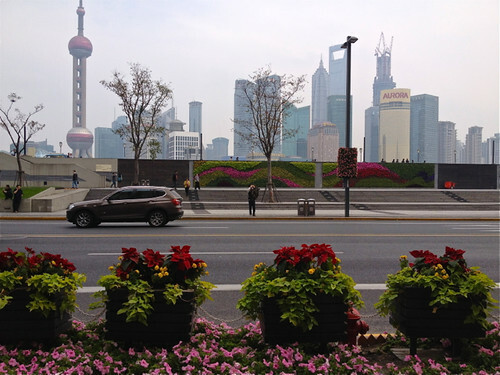 In the rapid development of grand cities such as Beijing, Shanghai and Xi’an there is always some space for gardens. Often these are quite small spaces squeezed in between freeways, but they are seen as important spaces for older people to gather for impromptu games of cards or mahjong and the early morning practice of tai chi. These gardens, and the plantings along road verges are always trimly cultivated – well-planned with diverse plantings and pruned into neat shapes. There’s a very grand tradition of gardens in China. 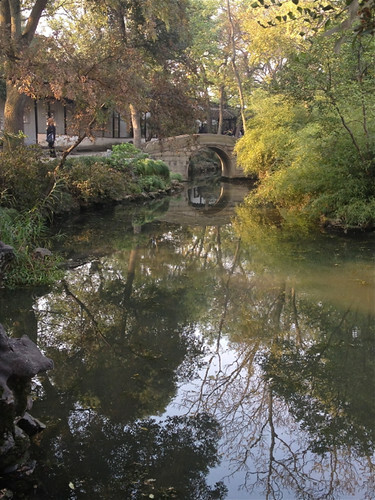 We were told that there are always four necessary elements to a Chinese garden – a pavilion, some water, rocks, and plants. Overall, the garden represents a person – the pavilion is the frame, the rocks are the bones, the water is the blood and the plants are the hair. Gardens are planned in detail and every aspect has a symbolic, poetic significance. 'Nature' is tamed and wrought to a pattern. We’ve spent time in the grandest of the gardens - the six centuries old Summer Palace outside Beijing, most closely associated with 18th century Emperor Qianlong who marshaled a 100,000 strong labour force to extend and beautify Kunming Lake. 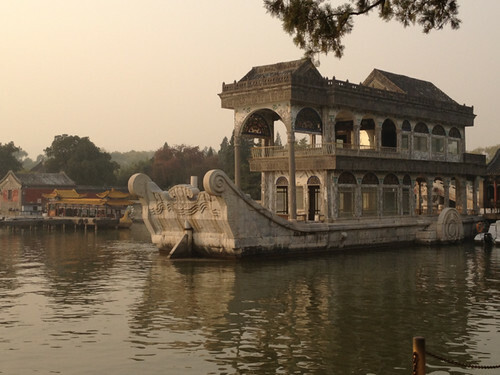 The Summer Palace is also renowned as the residence of reviled Empress Cixi who in the late 1880s diverted the navy budget to beautify the park and build one of the many stone boats scattered throughout China – symbol of the Emperor’s loyalty to his people. 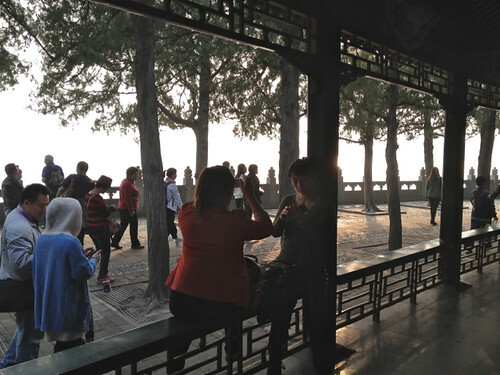 Nowadays the Summer Palace and its grounds are thronged with people day-tripping from Beijing - picnickers, three-generation families with their prized one child, young couples and the inevitable tour-groups. There are simple pleasures and attractions - music played on traditional instruments, a man wielding two giant calligraphy brushes to paint poetry with water on the stone pavement, and strolls through the long covered walkways. I've been delighted by the names of some of the gardens. The translation of the Chinese name for the Summer Palace is 'The Garden of Nurtured Harmony'. Perfect, as Chinese gardens are far from natural - they are carefully designed, constructed and nurtured to represent harmony. 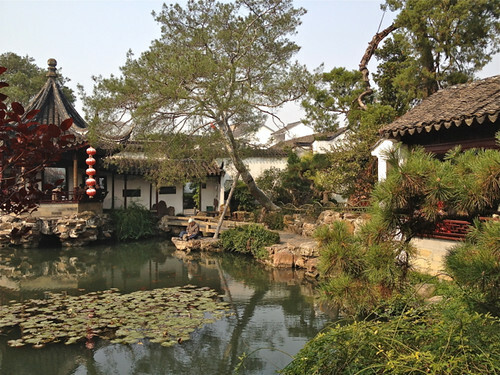 In the ancient city of Suzhou, whose classical gardens are classified by UNESCO as part of the World Heritage, we visited the small, meticulously planned Master-of-Nets Garden and the much larger Humble Administrator's Garden. I'm not sure if it's true, but we were told that a more accurate translation of the name of this latter garden is 'Incompetent Administrator's Garden'. Either 'humble' or 'incompetent' - both are great names. Within the gardens, the elements are even more charmingly named. Some of the charm might lie in the translation, but who can resist 'The Moon Comes With Breeze Pavilion' - the small pavilion on the left in the photo below, taken in the Master-of-Nets Garden. 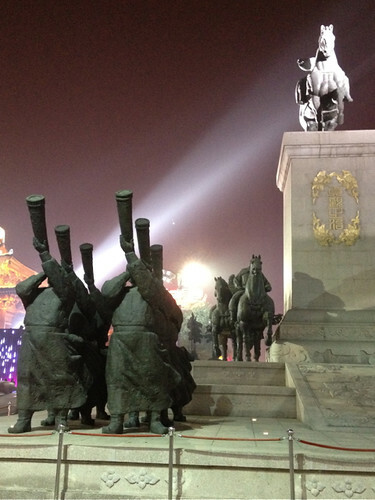 So much in China - both the ancient and modern - is laden with symbolism. I've developed my own not very original explanation. In so many ways China is a pragmatic society. Many matters are decided in eminently practical ways. It is, and has always been, relatively non-religious. The symbolism that is evident in artistic expression, architecture, language, and so obvious in the gardens, is a necessary romantic balance to the practicality of everyday life. 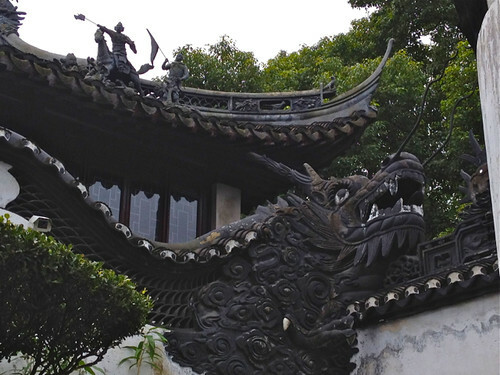 One of the nine dragons, Yuyuan Garden, Shanghai. The dragon is the ubiquitous symbol of power, strength and good luck. I always think I’m not interested in animals. 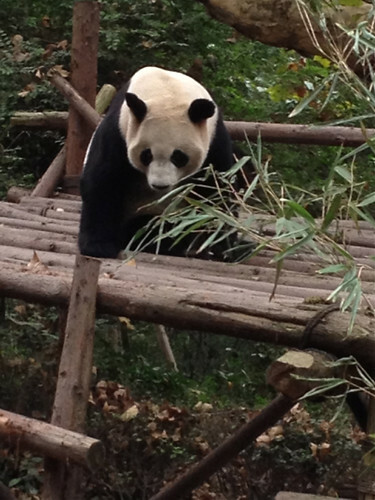 But last year’s trip to Borneo showed me I could be interested in – even enthusiastic about – orangutans and proboscis monkeys, and after my recent visit to the Chungdu Research Base of Giant Panda Breeding (that probably sounds better in the original Chinese) I’m more than a little interested in Giant Pandas. 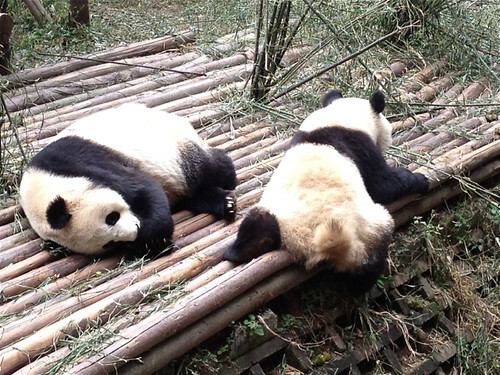 I’m not sure what it is that makes pandas so appealing. 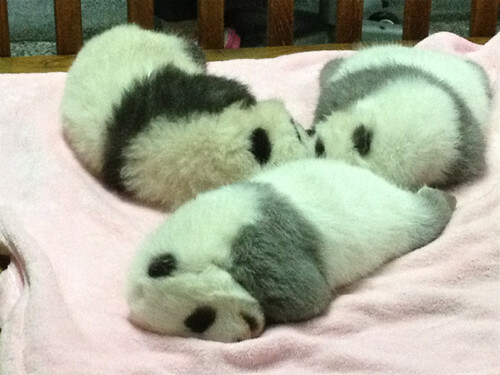 The black spots around their eyes and the black ears are so neat and regular. Their bodies are floppy – spreading softly as they collapse onto their backs or stomachs. An accident seems imminent as they climb trees and comically arrange their big floppy bodies on impossibly small branches. 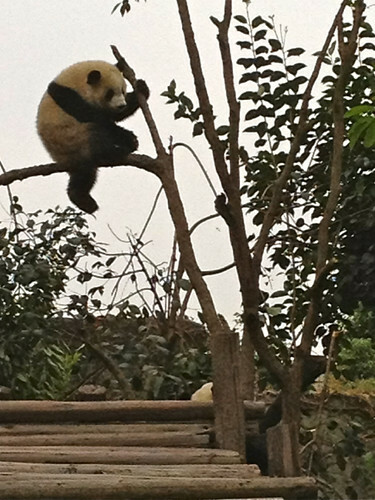 and solitary adult pandas doing their own thing. The large, seemingly natural enclosures enabled us to get unexpectedly close to the animals so there were lots of opportunities for watching their behavior and laughing and exclaiming. 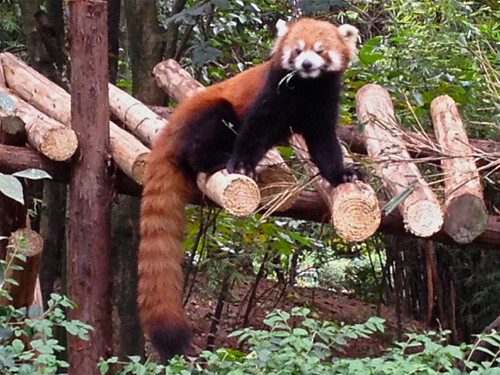 And as a bonus, there are also red pandas – another endangered Chinese species - who are sometimes called firefoxes. 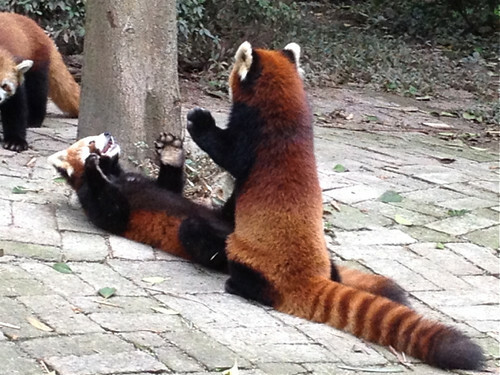 The agile red pandas are almost as engaging as the giant pandas, with their cute ringed eyes and brushy raccoon-like ringed tails. A victory for the animals. 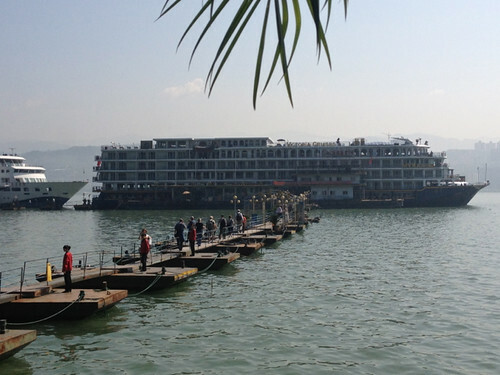 We’ve had a number of bus trips on our way around China: Wushan to Yichang where we embarked on our Yangze cruise; from mega-city Chongqing, where we left the Yangtze, to Chengdu; and Chengdu to Leshan in Sichuan province. 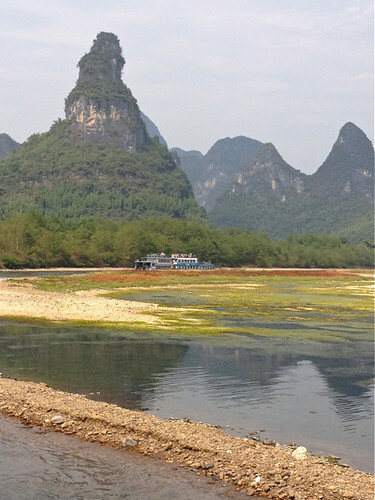 Later in our trip we travelled by bus near beautiful Guilin in the southern, semi-tropical area of China. I’ve enjoyed watching the countryside we’ve passed through. 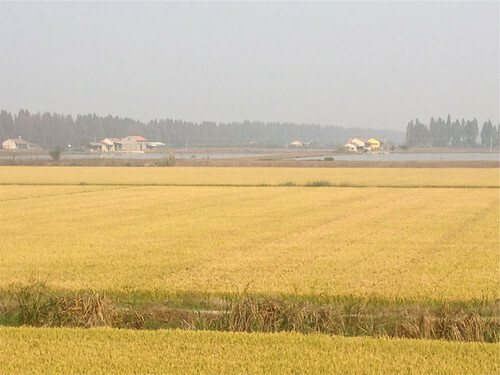 Most of the areas of China we’ve seen are very fertile and have been farmed for centuries. I’ve marveled at the diversity of crops grown on small landholdings. 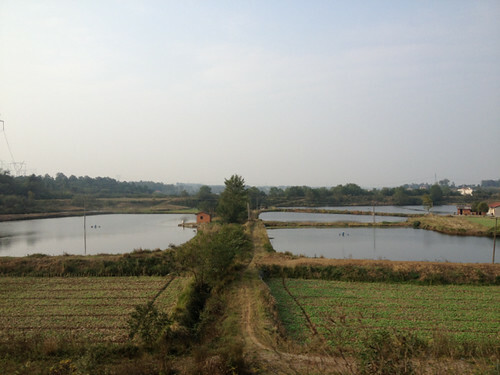 Between Wushan and Yicheng I could identify cotton, rice, corn, sweet potatoes, soyabeans, cabbages and fishponds, as well as other crops beyond my farming knowledge. and farmers were growing ornamental plants for the landscaping that’s so evident along city streets and highways and in parks. 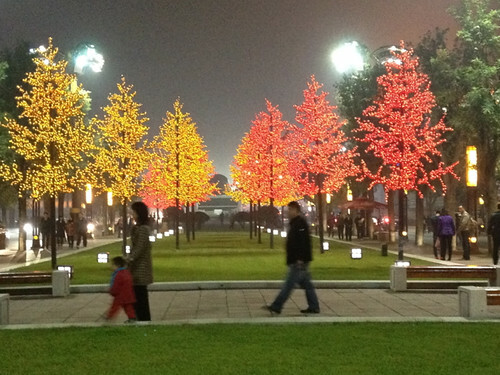 In particular, there were plantings of osmanthus, the ubiquitous flower of Guilin that's used to flavour sweets and drinks as well as for decorative street planting. So different from farming in Australia. 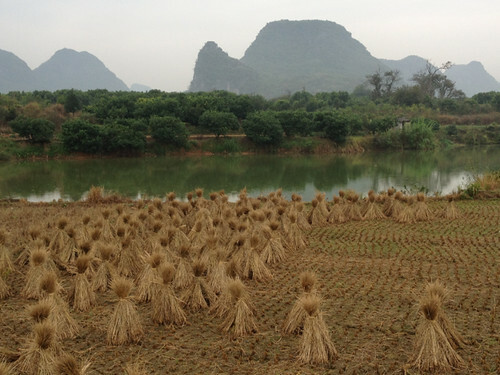 This kind of farming is one of the few cases in China where the scale of the activity in almost unimaginably small (though more diverse) than its Australian comparison. There’s a block long series of fountains that ‘dance’ to music that we were told was the biggest dancing fountain in the world. The ancient city wall that surrounds the old city centre is edged with lights and on our Saturday night in Xi’an we found a group of people from a surrounding town performing the local dances at one of the gates to the wall. When space is at such a premium, the public spaces become an extension of people’s living areas. We'd been informed that one of the onshore trips that was part of our Yangtze cruise was to be to Fengdu Ghost City. Given that the flooding of the Yangtze had depleted many of the old riverside towns and cities of their population and occupations I'd anticipated that the excursion would demonstrate some of the devastation of the Yangtze project. I was very wrong. The reality was more mundane, more complex and more puzzling. For more than two thousand years (so it is said) a series of temples that reach one above the other on a hill on the northern bank of the Yangtze has been known as the 'Ghost City'. 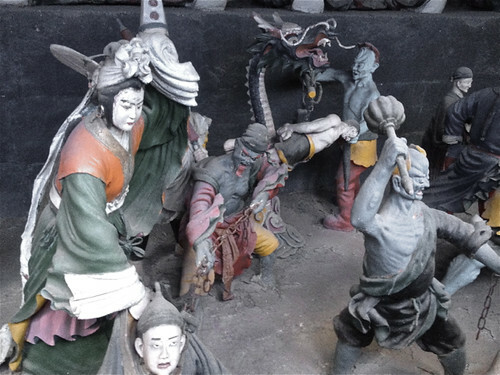 The temples, statues and gardens rather confusingly (at least for a Westerner) combine the cultures of Confucianism, Taoism and Buddhism with the mystique of ghosts. Nowadays, the atmosphere is more reminiscent of a theme park than a place of devotion. Most of the structures are modern, sometimes gaudy rebuildings, and the Ghost City is approached by running the usual gauntlet of tourist shops and hawkers. The complex is meant to illustrate hell with displays of demonic images and torture devices. It reflects the notion that good people will be treated well in the afterlife and bad people will be punished by going to hell - though its major emphasis is on the latter. There are images of devils and those being tortured - to my Western sensibility many of them were reminiscent of the paintings depicting hell by fifteenth century Dutch master Hieronymus Bosch. Fengdu Ghost City is now only a tourist attraction - more fun for the locals than for the Westerners who are more likely to be left puzzling out the significance of the site. I guess the attraction of 'hell' as a tourist destination is no more to be wondered at than the current Western fad for movies and books about vampires and the supernatural more generally. Still, Fengdu Ghost City left me wondering.